We have Ford's new global platform strategy to thank for the awesome Focus and Fiesta, but the drive to simplify its worldwide product lineup could have an unexpected downside. It could kill Australia's Falcon Ute. Oh noes! Why's the ute - a car-based truck - on the outs? Ford's talking about using the 2010 Ford Taurus as its new platform for all large sedans. Unlike the current Ford Falcon, that Taurus is a front-wheel drive platform (the SHO is AWD), making it unsuitable as a vehicle for hauling loads. Utes are a popular vehicle category in Australia, combining a truck-like ability to haul construction supplies by day and large amounts of beer by, well, day as well, with car-like handling and fuel economy. 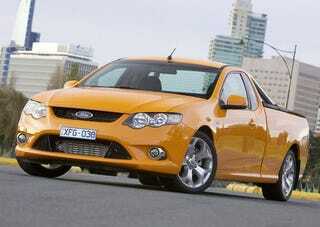 Along with the Holden Ute, the Ford Falcon dominates the category. Its loss would be seen as a huge loss to the Australian identity.